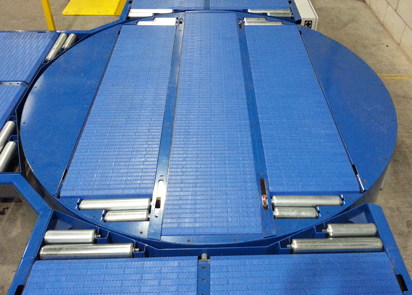 Powered chain transfer devices are used to transfer loads across a conveyor without pushing. These are powered, bi-directional and can be used as 90° transfers or at four-way intersections. Heavy duty load carrying chains replace a single roller and are pneumatically raised to effect load transfer. Distance between chains may be varied to suit application - units up to 5m in width. Pneumatic raise/lower frame and drive assembly contained within conveyor width. Reversible chains for bi-directional 90° load transfer or four-way conveyor intersections. Suitable for board transfer, loads on full perimeter pallets or pallets on baseboards. Non-powered roller transfers are a simple economical alternative to the powered chain transfer. 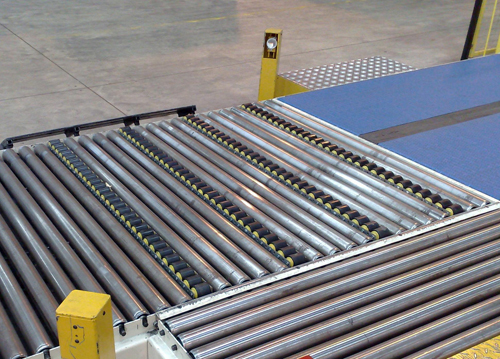 Small rollers pop-up between the load carrying rollers by means of a pneumatic controller. Once in the raised position the operator may transfer the load(s) onto a conveyor running at 90 degrees. 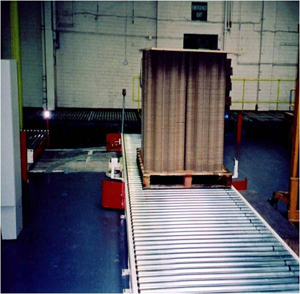 this unit may also be used to transfer loads onto a parallel conveyor line but in this instance two roller transfers would be required, one for each conveyor line. Transfer pusher devices are used at conveyor intersections to transfer loads through 90° or onto a parallel conveyor. Loads are also squared during transfer. 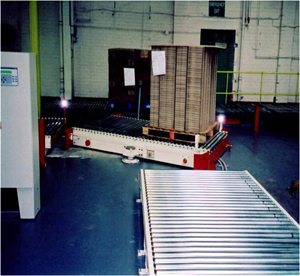 Wide pusher head squares and transfers loads through 90° or onto parallel conveyor. Design retains close pitch rollers. Pusher stroke ensures load is pushed past the edge of receiving conveyor. Integral torque limiter prevents overload. Minimum clearance between pusher head and rollers for safety. The IMS turntable is used where the orientation of the load must be maintained and in conveyor lines where a 4-way junction is required. 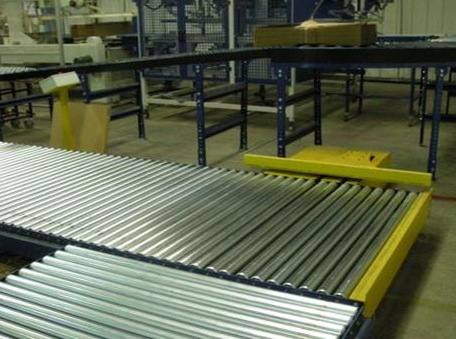 The conveyor style used in the turntable may be chosen to suit the product being carried. 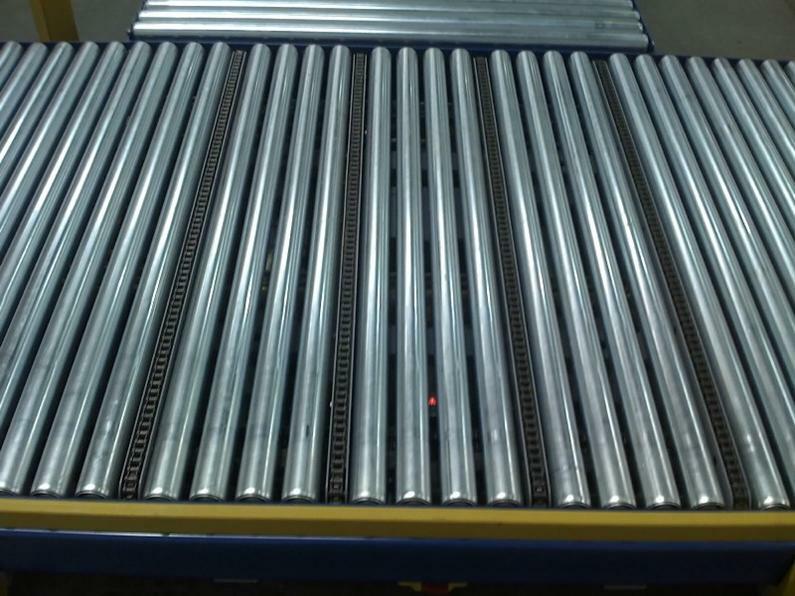 Our standard turntable size to suit finished goods conveyor lines is 2.5m diameter however the diameter of the turntable may be sized to suit your specific application up to a maximum of 4m. 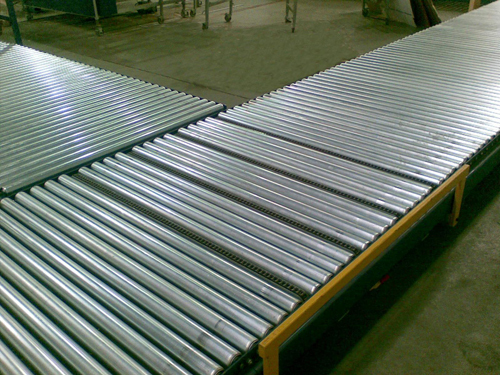 Roller transitions are used to improve the transition of loads onto the adjacent conveyor lines. these are separate from the turntable structure and may be provided as required. IMS Corner Pivot units are used to rotate multiple or very long loads through 90 degrees without altering the orientation of the load where a turntable would not be feasible. The pivot point may be positioned to suit the particular rotation and the specific layout required. Heavy duty pivot point for steady and smooth rotation of loads. 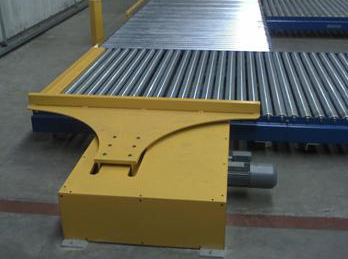 May be used in conjunction with all styles of conveyor drive. Mode of operation keeps load orientation correct for roller conveyors to ensure smooth transport of non full perimeter pallets. Length and width of unit is sized and designed to suit specific requirements. Multiple loads may be accumulated on the unit to maximise capacity and reduce cycle times. Heavy duty construction ensures reliability and long life. Photoelectric safety barriers to all sides. Audible and visual warning for safety. Steel floor tracks may be floor mounted or sunken. Pivot point may be located in almost any location to suit the required layout. Angle of rotation may be altered to suit specific requirements, 90° is standard.